The flavors of ginger, cinnamon and nutmeg give you a warm feeling with this cranberry and orange cake that will bring you in the holiday spirit. Cranberry and orange have to be one of my favorite holiday flavors this year. Cranberry is tart and tangy and orange is slightly sweet balancing each other out. 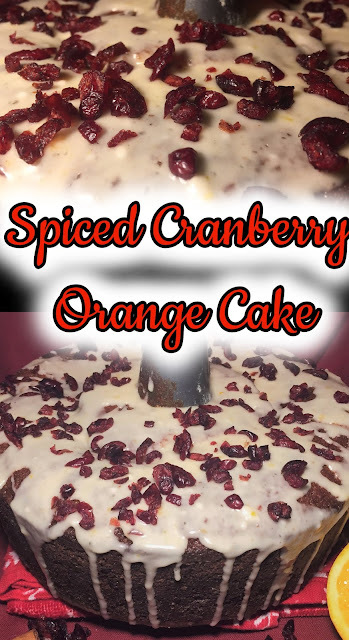 This cake was inspired by all the cranberry and orange potpurris that I have seen recipes for or cranberry and orange candles, my favorite but with a touch a spice to warm you up in these cold time. Its actually feels like winter where I live. I used these same flavors for some doughnut muffins last month, you might like it here the link to it: Spiced Cranberry Orange Doughnut Muffins. Makes them for Christmas morning and have the cake for Christmas dinner. 1. Preheat oven to 325 degrees. Spray tube pan with nonstick cooking spray and sprinkle with a little of flour. Set aside. 2. In a medium size bowl, whisk together 3 1/2 cups of flour, baking soda, baking powder and sea salt. Set aside. In a larger bowl, cream together butter and sugar for 5 minutes until light and fluffy. 3. On a lower speed add eggs to the butter and sugar one at a time then add orange juice and vanilla extract. Scrap the sides of your bowl. 4. In three parts add all mixture and in two part add buttermilk. Scrap the sides of the bowl. Toss dried cranberries and orange zest in the last 1/2 cup of flour then fold into batter. 5. Add batter to prepared pan and smooth out evenly. Bake in oven for 40 to 45 minutes. To check for doneness, stick a toothpick into the middle, if it comes out clean remove from oven and let cool in pan for 15 to 30 minutes then remove from pan to cool completely. 6. Whisk together Confectioners' sugar, orange juice, orange zest, ginger and salt. Drizzle over cooled cake and let it set before serving. This cook looks scrumptious! I also love the cranberry orange flavor combo! I have always been a fan of lovely citrus based cakes, especially when they are nice and moist on the inside. A spiced cranberry and orange cake looks so perfect for the season and I can't wait to give this a go! Spiced anything gets my mouth watering, especially this time of the year! Another great recipe! Thanks for sharing. I love these wintry flavors! So flavorful! I love all the spices you use. Thanks! You have included some of the best classic flavours of Christmas and made a delicious sounding cake. Just what you need when you want a sweet slice of treat. I want this for breakfast! Cake is totally ok for breakfast, right? Because you've got orange and cranberries, and it's Christmas after all ;) Thanks for the yummy recipe!! This cake looks delicious. Loved the flavour of cranberry and orange here. This cake looks like it will taste amazing. I am going to have to try this recipe as something I take for holiday parties. I am beyond excited to try this recipe out and see how it tastes. These flavors are perfect for the winters. This cake looks delicious and I would love to try it since it has cranberries and orange. i can just feel the workout that I am going to need to complete to make this! Boy does it look amazing so with 2 weeks off of work I am definitely going to give this a try. I love the holidays and this seems like the perfect holiday cake. I will definitely give this a try. Wow! That looks absolutely amazing! I probably won't be able to make it before Christmas but I would love to try it sometime this winter! I love spicy things at Christmas time - like teas, cookies and cakes, and this one looks particularly rich. And I hardly can believe how fast it's made! Great recipe. This sounds amazing! The cranberry and orange sound like a great combination. It's definitely a good desserts to make for the holidays. OMG this looks lovely. I am a fond admirer of cranberry cookies. This seems like an interesting recipe cranberry with orange cake. I am going to try this over the weekend and will let you know how it turns out. cheers. This looks so yummy! I hope you enjoyed. Thanks for sharing with us. Ah, that cake looks delicious. Currently, I'm living in a small apartment, and sadly I don't have an oven to bake that. But, anyway, your cake recipe seems quite interesting. I really like the pictures of the cake. I'm not a huge Cranberry fan, but I think one could easily substitute cranberries for another fruit. I love the flavor combination of cranberry & orange - and the cake makes such a pretty prevention too! The Orange and cranberry combo sounds amazing! I'm not a chocolate fan but you make this look tempting! Im still learning to bake and Ill add this on my list, thanks for the well detailed procedures and the pics theyre really helpful. This spices cranberry orange cake looks so delightful. I am looking forward to try this recipe. I love this! Thanks for the recipe as I enjoy everything with cranberry in it. Oh my goodness, that looks so delicious! I wish I were better at baking. The best I can do is cookies or cake from a box. This recipe sounds amazing. I’ve never had cranberries but I’ll give anything a go once. Thanks so much for sharing.! Sounds and looks like a delicious holiday dessert. This sounds like great idea especially now that it's the holiday season! I am sure the kids and adults alike would love this! Oh such delicious dessert! I'm really glad that you made a perfect combination between orange and cranberries, I never tried it yet but would love to do it for chocolates as well. I've been rooting this non sugar added chocos I'll surely try it out together with my other experimental ingredients to add. This cake looks delectable! I love the cranberry and orange combination - I have tasted it in bread before, but I bet it's even more amazing with this recipe and the glaze is the perfect topper. YUM! This looks delicious anencephaly perfect for the season! We may add this to our Christmas dessert table. Thanks for the recipe! YUM, this looks amazing, I'll definitely have to give it a try! OMG this looks totally amazing. I am certainly making this soon. Hopefully Friday, before the holidays and then again on Christmas morning. This sounds divine! I love the combination of orange with cranberry. This is the perfect holiday dessert. Yum! THis cake sounds delicious! I love orange, cranberry, and ginger, so having all three in one cake would be a treat. And I love that you didn't skimp on the orange zest! I love the combinations you prepare salty and sweet and this one spicy!! Cranberry and orange are my favorite! !